Posted: November 11, 2016 in Fotos, Who,What,Where & When...? The race was held on New Years Day, 1 January 1948, the Victorian won from Granton Harrison’s Phillips Ford V8 Spl and Ron Egerton’s MG TC Spl which is in shot behind Gullan above. 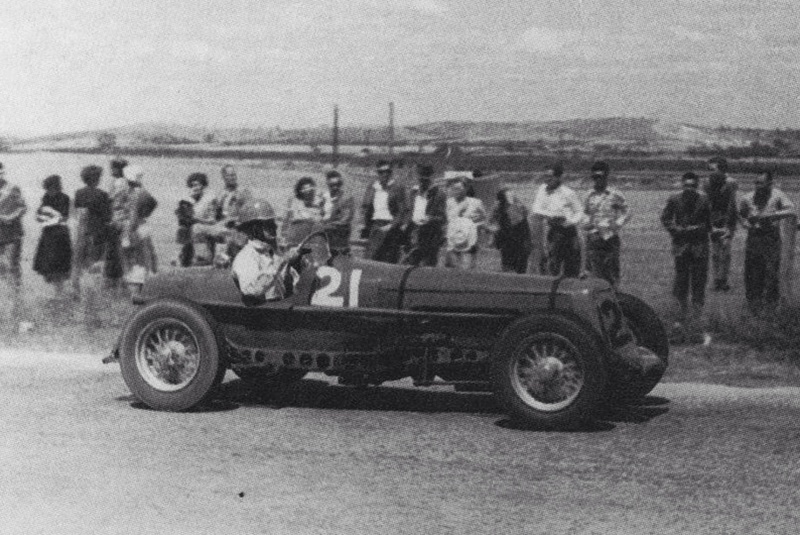 Amongst the 21 ‘South Australian 100’ entries were later champion drivers Tony Gaze, Bill Patterson, Doug Whiteford and Ern Seeliger as well as then current fast-man John Barraclough. The limit man was D Howard’s MG PA with a handicap of 16.5 minutes, Jim Gullan’s Ballot was away at the 7.05 mark, Doug Whiteford off 2.5 minutes with the scratch car Denneston’s Itala Mercury Spl. Whiteford stunned onlookers with an 85mph standing lap, Ern Seeliger was an early retirement after being badly baulked at over 110mph, assaulting two trees in the process. The car was destroyed, the owner presented the rooted chassis and body to a local farmer! Ernie suffered only a bruised wrist and severe shaking and lived to be a formidable engineer and competitor until late in the 1950’s. By lap 4 the positions on handicap were the Harrison Ford Spl from Ron Edgerton’s MG TC and Whitefords Ford Spl, the latter on a path, at the speed he was going, to win the race before a rear tyre threw a tread. With no spare the Melbourne driver was out. By lap 7 Gullan led from local driver Harrison in the ex-Phillips Ford V8 from Skinner in the Ballot Ford and Andrews Austin 6 in 4th. Barraclough withdrew due to low oil pressure on lap 9 and Bill Patterson was out of fuel on the same lap. On the last lap Gullan still lead by several hundred metres from Harrison and Edgerton’s MG TC. Harrison did the races fastest time and Whiteford its fastest lap at 6 min 7 seconds, 88mph and won the Lobethal 50, the final event of the program. 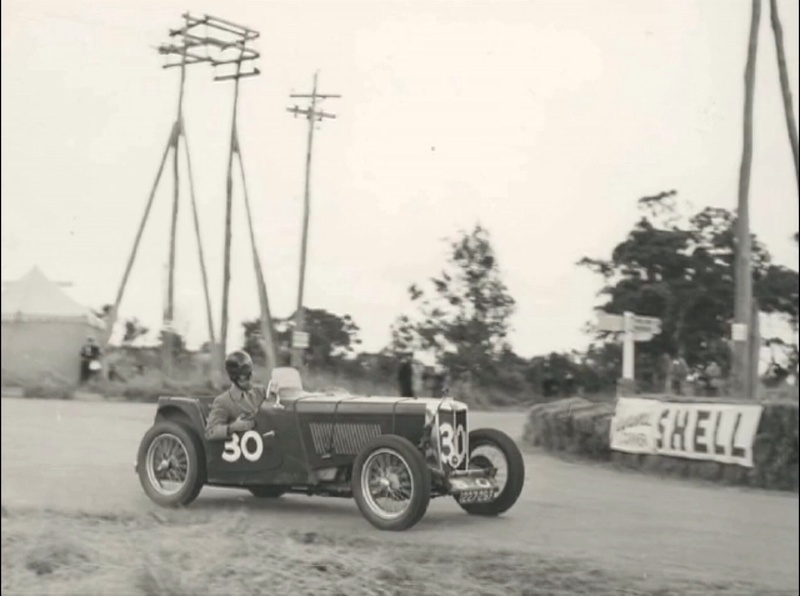 Jim Gullan replaced his Ballot Ford in 1944 with a 2 litre Ballot bought nearby to his families garage in South Melbourne, a chassis for the car was designed and built by Gullan styled on the ERA, the racer was fitted with an Oldsmobile engine and gearbox. 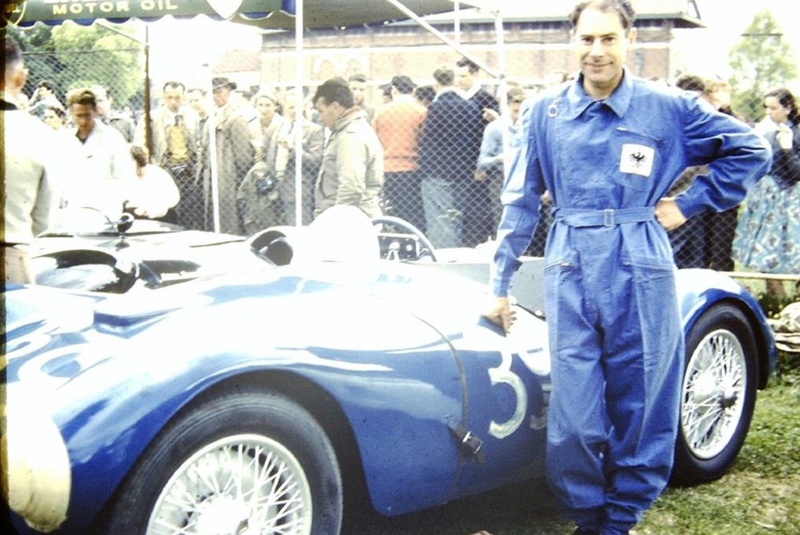 Noted journalist and historian Ray Bell; ‘Jim Gullan’s Ballot will always rank as one of those cars that looks the part of an Australian Special. The raked nose, the heavily drilled chassis, steering wheel close to the chest and mandatory straps over the bonnet, its wire wheels carried a car that mixed European and American as well as any other’. Gullan’s book, ‘As Long As It Has Wheels,’ is a fascinating account of a drivers career which evolved from road racer pre-war, to racing an Alta in Europe after hostilities ceased, through being a pioneer of drag-racing in Oz in the 1960’s and finally as a club racer in his dotage living on Queensland’s Gold Coast. Amazing. Jims book covers the Ballot in detail. Gullan’s Ford V8 powered Indianapolis Ballot, his new acquisition was a 2 litre with sohc engine and knock-on wire wheels, it had a poor body and as inspection proved, the chassis was in even worse shape. Soon after buying it a workmate offered money for the engine, gearbox and radiator to fit into a Bugatti chassis. Said Gullan, ‘It seemed a dubious exercise but I suppose any engine was better than none.’ Having just the chassis left, he was reluctant to go for another Ford engine having had bad experiences with the V8, so an ad for an Oldsmobile unit and ‘box (unused spares purchased for a taxi) overcame his problems. It was to have triple Ford carbies and extractors. A chassis was made styled on the ERA but lower in profile, and used nothing from the Ballot chassis such was its parlous condition. ‘By the time the Ballot Olds was completed, about the only parts left of the original Ballot were the wheel hubs. The only reason the Ballot name was retained was for (ease of) registration purposes’ wrote Gullan. With new cross members the engine and gearbox were installed into the chassis and the body shape was outlined using welding rods and strands of string. Bob Baker lived only a few doors away from Gullan and built the body round an angle iron frame, which was screwed to the chassis with small reject aircraft bolts. A deliberate effort was made to reduce frontal area, hence the car’s low appearance. Quick-fill petrol and radiator caps were fabricated by Jim and the instruments (like the carbies) came from army disposals. 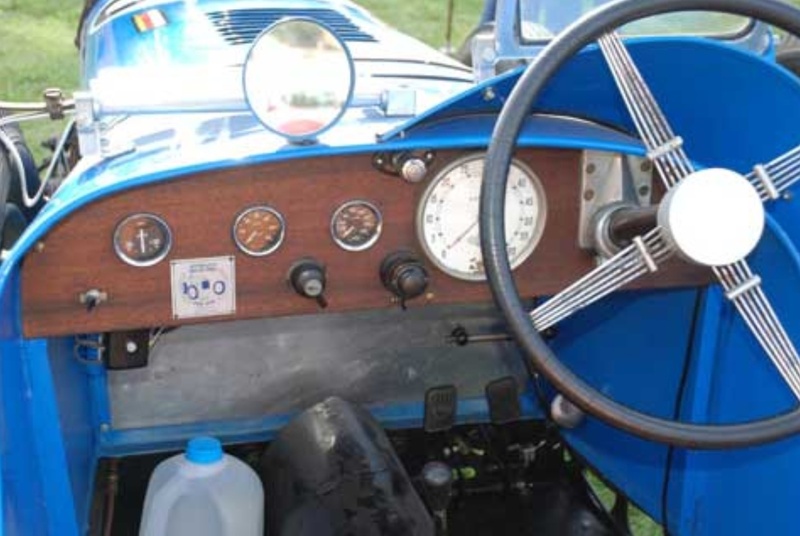 With Baker’s assistance a 3 carb inlet manifold and extractor exhaust system was made and a Ford radiator shell reworked to look like an ERA, the gorgeous little car was painted blue with silver wheels. Finned alloy drums off a spare 2-litre Ballot Jim bought and sold were the first of many modifications over the years. 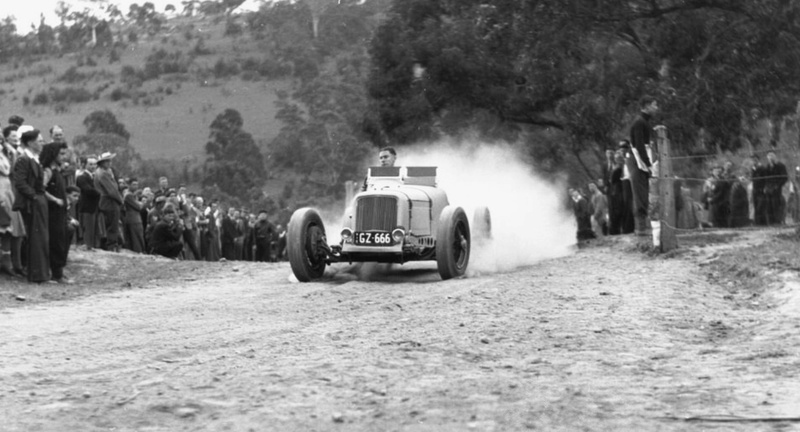 The Ballot’s first meeting was at Greensborough Hillclimb in 1945 (see below), teething problems were limited to the throttle linkage bending and as a consequence full power could not be applied. The rear axle ratio was made taller, the drawings for the 3.5:1 ratio done by Gullan. 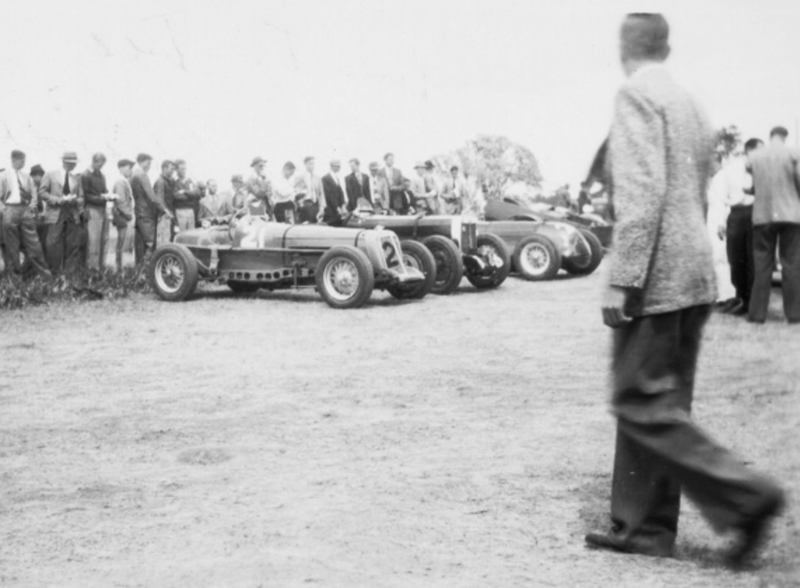 The first post-war race was at Ballarat at the beginning of 1947. Gullan had a good meeting including winning the Ballarat Cup, after this meeting the cars braking system was converted to hydraulic operation. The next race was the Lobethal 100 covered at the articles outset, ‘The main reason for my quick times was my familiarity with the track. I had driven there in 1938 and 1939…in handicap racing it was our policy (Jim and his time-keeper wife Christine) and although the handicappers kept putting us up the field, we just made the car quicker’. Gullan was a close friend of and in business with Doug Whiteford. When Doug imported an Edelbrock cam and heads (he’d melted a pair of alloy heads at Lobethal in 1940!) Bruce Rehn copied the cam profile and lift for the Olds. 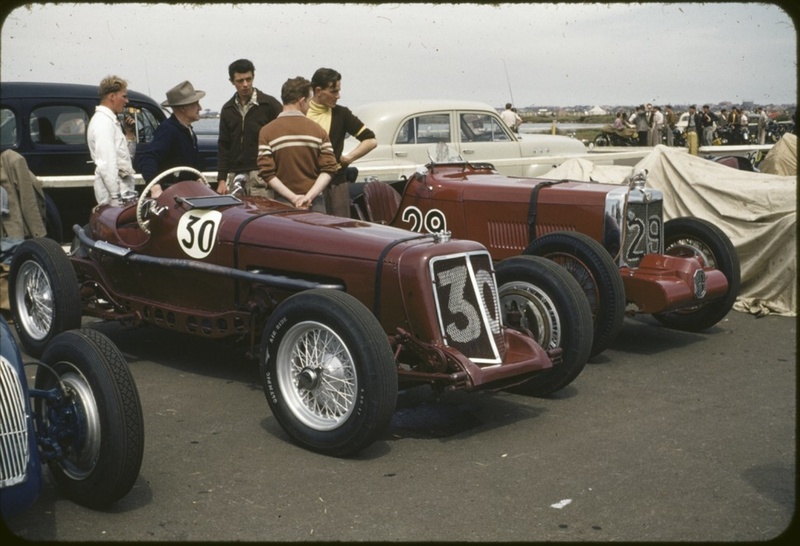 By the time of the Point Cook AGP (1948) ‘…at a Dutch auction at the Light Car Club before the race, the Ballot was selected as the car most likely to win, a bad omen as far as i was concerned’, quipped Gullan. For the AGP there was yet another higher lift cam lifting rpm’s to 6000 and special ratios in the gearbox. As a result of the intense heat at Point Cook, with the Olds running so cool and well, the engine was subsequently bored by 5mm and also fitted with an enlarged sump with cooling tubes. Gullan had tyre problems in practice, but retired the car in the extreme heat after 15 laps. ‘I finished up sitting next to Alf Barrett, in the back of a van getting cooling down treatment’. At Fishermans Bends first meeting Gullan won the Victorian TT, but the stop-start nature of the airfield circuit made it clear the cars brakes needed development. Jack Pearce at Repco PBR supplied some light commercial brake drums and made appropriate shoes with aluminium backing plates. ‘…They were so powerful they were bending the chassis making the car almost unsteerable when braking on the rough roads. The only thing to do was to apply them gently’. In the months leading up to the 1950 Australian Grand Prix at Nuriootpa the Ballot was run in various minor events to get it sorted. Jim started 21st of 43 starters. The race was billed as a handicap race, Gullan won the handicap but not the Grand Prix which was awarded to Doug Whiteford in Black Bess. Jim was not happy about the result and emphasis given to the ‘fastest time’ as against the ‘handicap winner’, the AGP having been run as a handicap since it’s start at Phillip Island. ‘Normally the car would run 130 miles on a tank of fuel, but with the car developing more power, it was decided that if i was far enough in the lead i would pull in for a quick stop to add 10 litres. This i did and drove over the line to win what i thought was the Australian Grand Prix. There were still 20 litres of fuel left in the tank at the end of the race’ and therefore he could have completed the race without a stop. A counterpoint to Gullan’s viewpoint is contained in ‘The History of The AGP’ which makes it clear, quoting the Australian Motor Sports contemporary magazine coverage of the race. 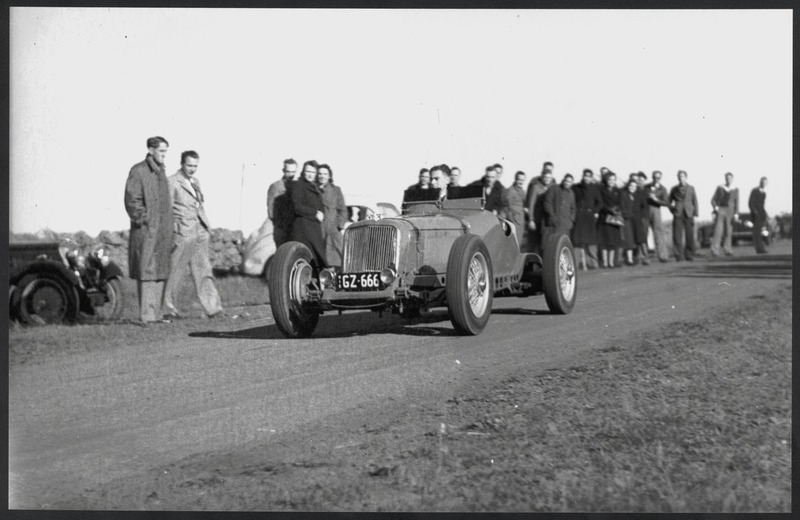 It says, that consistent with the 1949 policy of the Australian Automobile Association, from 1949 the AGP would be a scratch title,’The Australian Grand Prix will be run as a handicap but the Grand Prix winner will be the competitor finishing with the fastest time for the race’, that is, Doug Whiteford in his Ford V8 Special Black Bess. Gullan raced the car one last time at Fishermans Bend before selling it. 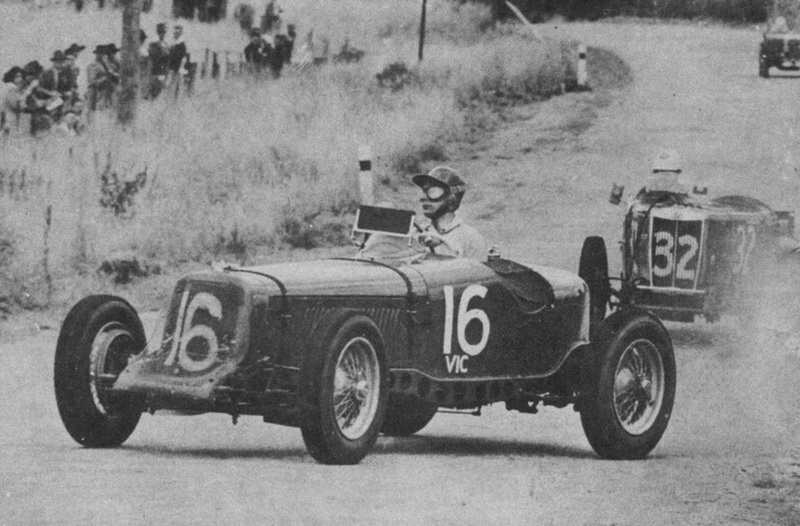 Interestingly the two great mates, Whiteford and Gullan who had developed their clever specials together drove one anothers cars one evening at Albert Park ‘Dougs impression of the Ballot; very smooth high revving engine, steering and brakes too sensitive, difficult to drive!’ wrote Gullan. Albert Park is a public park, it would have been interesting to be going for a post-dinner walk and seen two Grand Prix cars being driven at high speed around the sleepy confines of Albert Park, the first GP there was still several years away at the time! It was now 1950, the Ballot had reached the end of its development, and Jim decided to race in Europe, an interesting story for another time. Alan Watson and John Cummins (the latter very sadly died only last weekend) bought the car for 850 pounds. 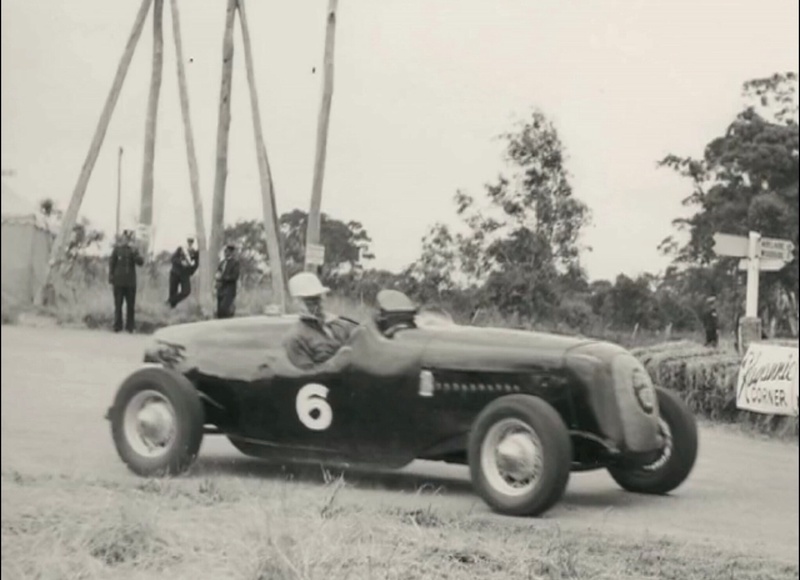 Ray Bell, a writer of the ‘History of The Australian Grand Prix’ puts Gullan’s wonderful car and his design and development skills in context ‘The car was Gullan’s expression of all he’d learned from observing racing and running his own Salmson, Wolseley, Austin and Ballot V8′. ‘He mentions getting airborne over the top of the hill approaching Lobethal at 110mph, touching 116mph on the straight and holding it flat all the way from Lobethal to within sight of the pits at that early stage of its development. 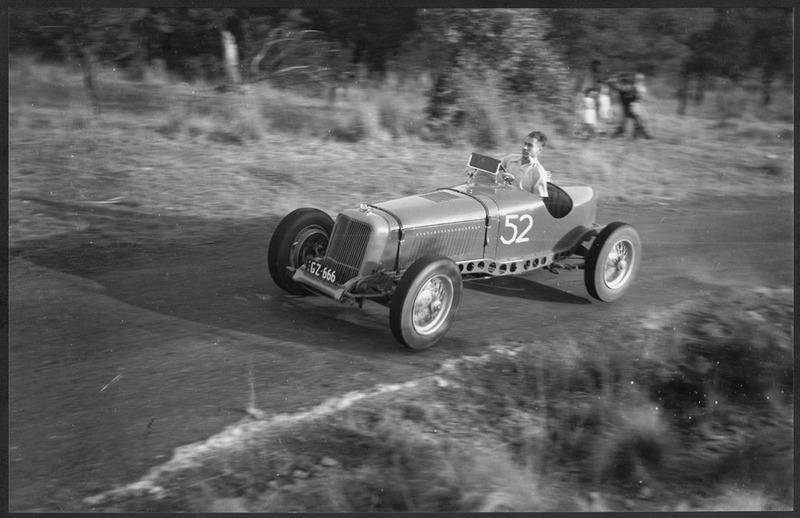 By the time it won the handicap section of the 1950 AGP it must have been a fairly quick car’. The car passed through many hands over the next 20 years, raced as late as 1963 at Calder, Victoria. It has been used since 1970 in historic events, and is still alive today in Frank Moore’s Collection of Australian Specials in Queensland. Its interesting this internet thingy, data and images are being uploaded all the time. 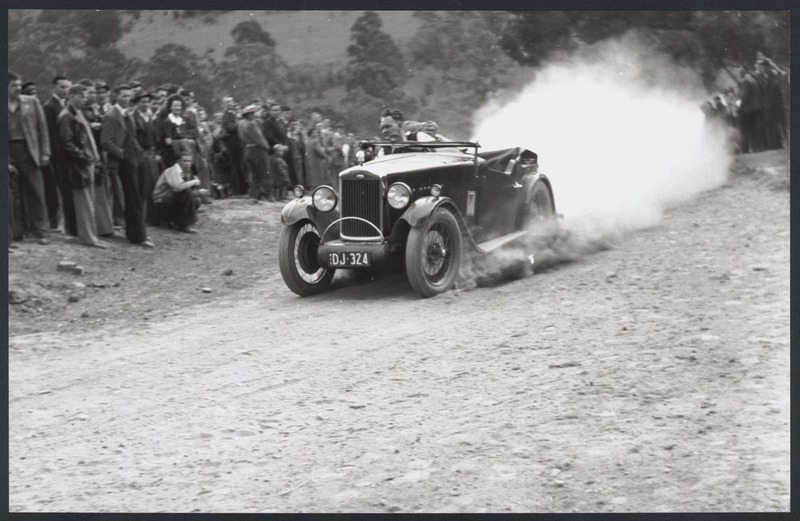 When I wrote the article about the Lobethal AGP 1950 12 months or so ago some of the images in this article weren’t there, but information is being continually shared through this wonderful medium. 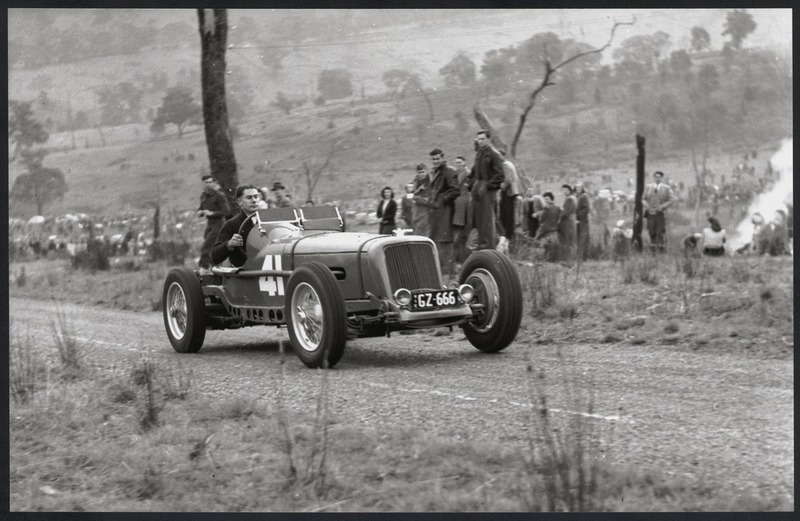 The shot above is of Jim’s car at the second Greensborough Hillclimb on 7 October 1945, an Australian Motorsport article describes the casual nature and speed at which a new venue could be created all those years ago! 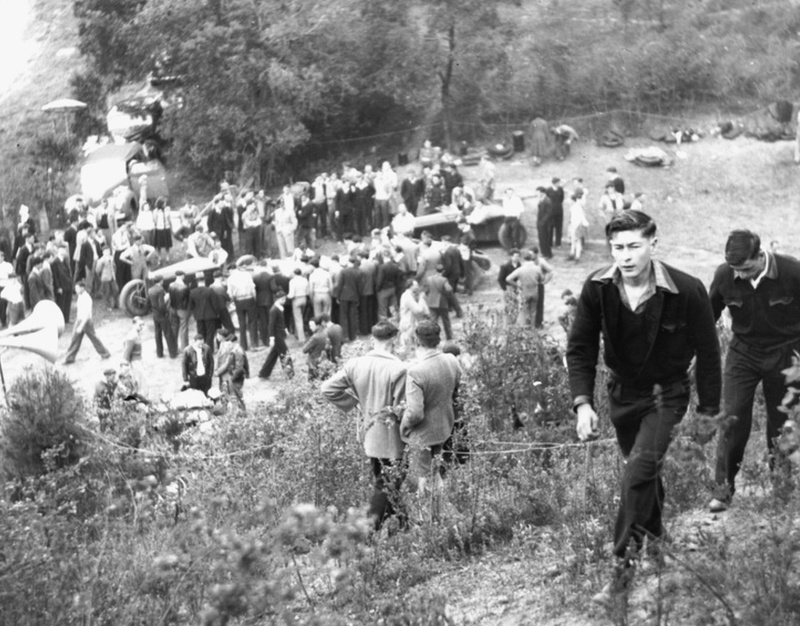 The Australian Motor Sports Club sought the use of the LCCA’s Rob Roy Hillclimb to run its first post war event. When the LCCA refused the club permission they sought other venues. Every alternative ‘smooth enough and close to Melbourne’ failed until the club secretary George Beecham fluked on a market gardner, an ex-motorcycle rider…His property had a very stiff hill. It was decided at the club meeting on the Thursday night before the Sunday scheduled for the climb to hold it at Greensborough on the market gardners hill. The owner of the property Bill Halliburton, did everything in his power to knock the hill into shape for the club…to get the hill right in time’. Try getting a hillclimb built and certified by the FIA/CAMS in two days today, different times weren’t they! Jim Gullan recalls the event in his book, he was Vice President and Doug Whiteford President of the AMSC. The two great mates loaded up a utility filled with reject concrete slabs from the Hume Pipe Company, for whom they worked and set off for ‘Orchard Farm’ to lay out a starting grid, completing the exercise in pouring rain. So much rain fell on the Saturday the event looked to be a washout but the can-do attitude of the members, starved of competition during the war years prevailed and after the track dried competition took place with FTD going to Ern Seeliger’s Ford V8 Spl. (the car destroyed in the SA 100 event in 1948 described at this articles outset) It was the union of an Itala chassis, with large drum brakes, a 3:1 diff ratio powered by a modified ’38 Ford V8 modified with high compression heads and a Vertex magneto providing the spark. The engine was mounted low in the chassis, the car raced in chassis form devoid of body. ‘Greensborough No 2 was just as well organised and ran as smoothly as the No 1 event was bad. Everything seemed to go right, even the Melbourne weather! The hill had been prepared at some very substantial cost to the club and was as smooth as a table-a good table too’, you will note from the photographs that the surface was gravel. The AMS report notes the pace got hotter as the day progressed with several cars leaving the track, notably an elderly Morris Spl, a Vauxhall, Stud Beasley’s Speedcar and Ted Gray’s Ford V8 powered Alfa Romeo 6C1750, Ted broke the diff of the car in the process. 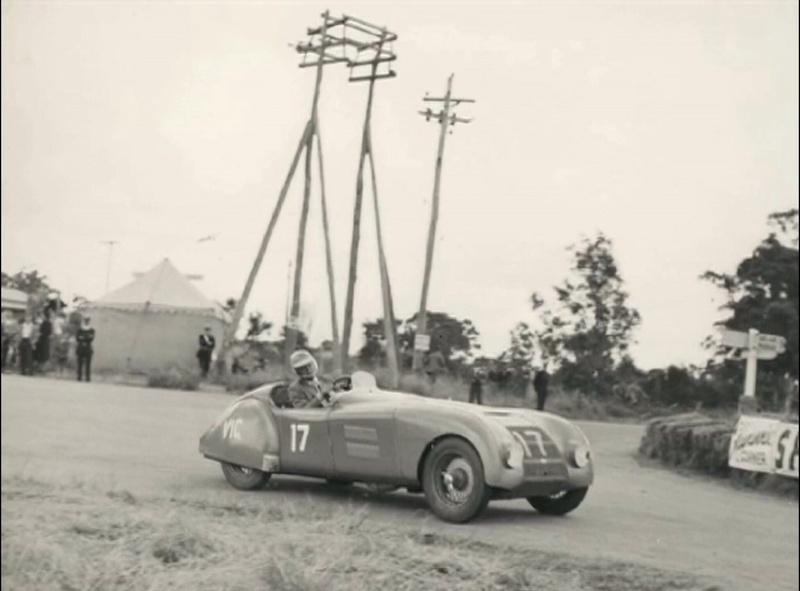 Ken Wylie set fastest time of the day in his Speedcar but ‘in doing so rushed through a fence after he had completed his climb, cleaned up half a dozen push-bikes leaning against said fence, bowling over a gum tree and ended up in a ditch…’. Doug Whiteford fitted dual rear wheels to his Ford V8 engined 1950 AGP winning special ‘Black Bess’ but struggled to get traction, as did Ern Seeliger’s car the AMS report noted. That report concludes by listing other competitors cars; Ken Hume’s 8/60 Buick engined Talbot, Tom Hollindrake’s MG s/c, Les Phillips Austin Spl. 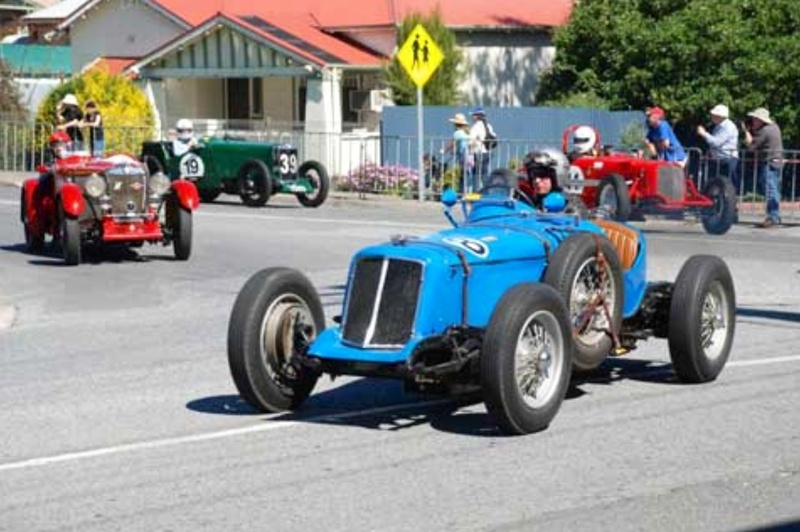 Gullan’s Ballot Olds only had two runs, as the event organiser he was preoccupied, Bob Chamberlain’s Chamberlain 8 and Stud Beasley’s Willys 77 Speedcar also competed. What is interesting is the way a large number of hillclimbs relative to the population of Melbourne at the time, popped up in an arc on the cities outskirts from the north-east to the east of the city; Greensborough is 23 km from town, Templestowe 19, ‘Rob Roy’ at Christmas Hills 43Km and the two climbs at Lilydale, the Davisons ‘Killara Park’ property and Ern Abbott’s ‘Lakeland’ circa 45 Km from Melbourne. They weren’t all running concurrently mind you, some were. I suppose the reasons are availability of the right terrain and proximity to the city for competitors. Wonderful. I was at Kayannie corner helping my father who was an official.It started a life- long association with motor sport. I was also at Nurriopta. I always wanted to know more about the Ballot and glad to hear that it is in good hands. I’ve been fiddling with an 1939 AGP article for the last couple of hours- including a shot of Jim’s Ballot which DNS that race. I am a Lobethal tragic, hope to swing thru again over the summer. You are lucky to have your Dad point you in the right motor racing direction from the start!